Wayfarers is now accepting applications for our 6th annual Summer Artist in Residence Program. The program awards one artist the opportunity to develop a project or body of work in the supportive environment of Wayfarers, where 10 - 20 other working artists have studios. The selected artist is offered our 400 square foot ground floor gallery to use as a studio for 2 months (July and August 2019) and awarded unlimited access to the Wayfarers facilities, including the wood shop and silkscreen equipment. The residency culminates in a solo exhibition in the gallery in September 2019. Wayfarers is located on the border of the Bushwick and Bedford-Stuyvesant neighborhoods in Brooklyn, in what has rapidly become the latest New York haven for artists and musicians. Wayfarers Summer Artist in Residence program is based on a competitive, open application process. Completed applications received by the deadline (March 15, 2019 at 11:59pm) will be reviewed and voted on by all current artists, ghost members, and board members at Wayfarers. Open to all professional artists who would benefit from the program and can commit to 40+ hours per week in the studio during the entire residency term (July and August, 2019). Artists who are enrolled in a school, college, or university are not eligible for the program. Artists of color are especially encouraged to apply. The online form must be completed in its entirety before submitting; you CANNOT SAVE your work AND RETURN to the form. We highly recommend that you download the instructions and prepare your application materials in advance and prior to entering the online application. Wayfarers Artist in Residence program was founded by board member Serra Victoria Bothwell Fels who invited then Florida-based artist John Orth to be our inaugural resident in the summer of 2014. The work that John produced and the energy he generated during his summer with us was genuinely inspiring to the Wayfarers community. Since then, each January, an artist is selected through a competitive, open application process that is reviewed and voted on by all Wayfarers members and board members. The selected artist is given a studio with us for the summer and a solo exhibition in our onsite gallery in early fall. 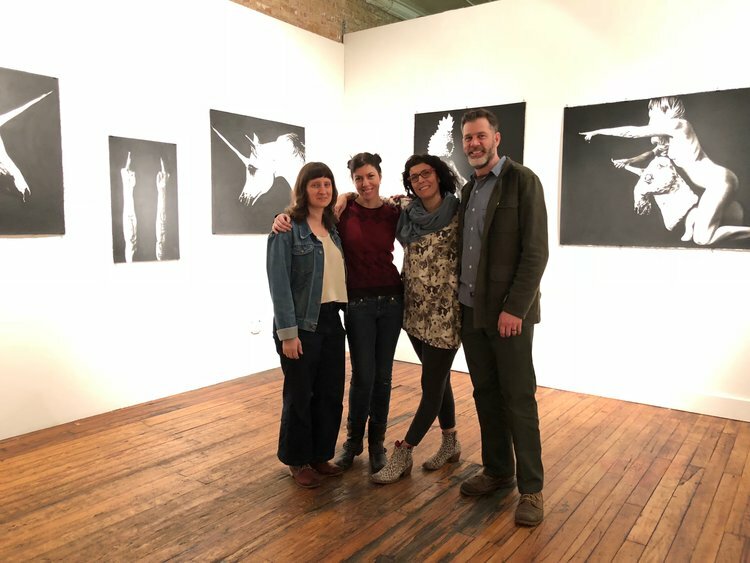 In 2018, unanticipated changes to our building prohibited us from offering a physical residency, but we still thought it important to connect one of the artists our members selected with the Brooklyn arts community. Los Angeles based artist Leslie Lanxinger was a finalist during our 2017 application process, so in January of 2018 we invited her to stage an exhibit of new drawings. We were pleased to have had the opportunity to exhibit Sick Rose, and thrilled to extend our relationship with Leslie Lanxiger and her work by presenting this introduction to her studio practice and processes.